Alex Adrianson is editor of The Insider. The conservative movement lost a number of its leaders, heroes, and colleagues last year. Before we get farther into 2016, we’d like to take a moment to note some of the people we will miss. Anderson wrote a paper that helped end the draft in 1973, advised Ronald Reagan on his domestic agenda of tax cuts and deregulation, and wrote the history of the Reagan presidency in a series of highly acclaimed books. Over nearly six decades of teaching and writing—at Louisiana State University, Yale, Cornell, the University of Toronto, Georgetown, and the American Enterprise Institute—Berns helped revive an appreciation for the Constitution and citizenship. He also presaged today’s threats to religious liberty when he wrote in 1963 that the Supreme Court was wrong to have invalidated school prayer. A pioneer in using economics to study the law, Manne wrote the first scholarly work challenging the idea that insider trading is a real public policy problem, then advanced a similar heterodox argument regarding corporate raiding. He founded the Law & Economics Center at the University of Miami (later moved to Emory University and then to George Mason Law School), which at one point could boast that one-third of the federal bench and four members of the Supreme Court had attended its programs. The globe-trotting correspondent wrote novels warning that the Soviets were actively duping the Western press, became editor of the Washington Times and turned the paper into the conservative alternative to the Washington Post, and interviewed Taliban leader Mullah Omar in the hills of Afghanistan just three months before 9/11. Originally a physician, Templeton made the Templeton Foundation a major distributor of grants for research on the big questions of life, including the role of free enterprise. Wattenberg challenged the fashionable doom-and-gloomism of the left in an attempt to pull the Democratic Party back to the center. He ultimately failed in that task but in the process created a one-of-a-kind show—Think Tank—that emphasized facts instead of shouting. Conquest’s histories, especially “The Great Terror: Stalin’s Purge of the Thirties,”revealed the extent of the crimes perpetrated by the Soviet Union and exposed the mendacity of its apologists. Howard, president of Rockford College for 17 years, led a coalition of university presidents who warned of the dangers of federal funding for higher education. Then he founded the Rockford Institute, which for the past 39 years has worked to defend the cultural institutions that the left tried to tear down in the 1960s—the family, the church, and the rule of law. Schramm—Hungarian by birth and American by choice, as he described himself—helped thousands of college students understand America’s Founding principles and appreciate what it means to be an American. Along the way, he built Ashland University’s Ashbrook Center for Public Affairs into a leading center for the study of American constitutional government and political thought. Ball founded Donors Trust in 1999 as the solution to the problem of foundations straying from the conservative and libertarian intentions of their benefactors. Under her leadership, Donors Trust distributed over $740 million to pro-liberty causes. Kass used stories—teaching the great books of literature for 34 years at the University of Chicago and compiling notable anthologies—to encourage reflection on what makes a life well-lived. Since 2005, she was a fellow at the Hudson Institute, where her work focused on philanthropy and citizenship. Von Kannon helped found The American Spectator in the late 1960s, then spearheaded The Heritage Foundation’s development efforts for 32 years. 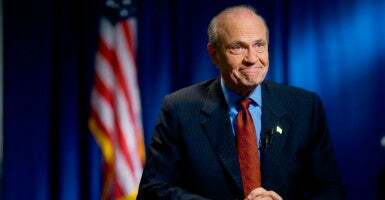 In addition to raising over $1 billion for conservative causes during a 43-year career, he mentored countless fundraisers throughout the conservative movement. Through his work at the Relm and Earhart Foundations, Ware helped create a variety of fellowship programs supporting conservative and free-market scholarship at a time when academia was overwhelmingly liberal. Among those supported because of Ware’s efforts: Friedrich Hayek, Milton Friedman, James Buchanan, Gary Becker, and Ronald Coase. Thompson asked Alexander Butterfield if he knew of the existence of any listening devices in the Oval Office, and a year later President Nixon resigned. Then he brought down the governor of Tennessee with a lawsuit that revealed a cash-for-clemency scheme and parlayed a role as himself into an acting career. Representing Tennessee in the Senate from 1995 to 2002, Thompson was a strong voice for keeping the federal government out of matters better left to state and local governments. He also ran for the GOP nomination for president in 2008.